Some dreams are best experienced awake and winding along the Amalfi Coast of Italy was a dream come true. It has long been on my bucket list and there was not one moment when I experienced disappointment. Each morning the rising sun would burn off the fog to reveal dramatic cliffs that seemed to disappear into the clear blue Mediterranean waters. 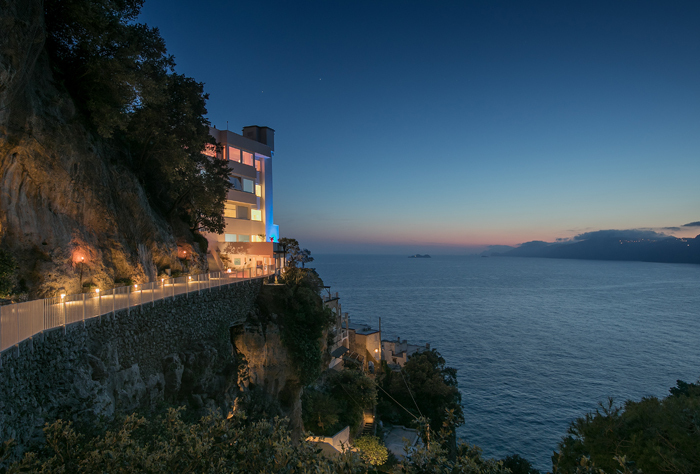 Every evening we would retire to the terrace to take in the warm hues of the Amalfi sunset. 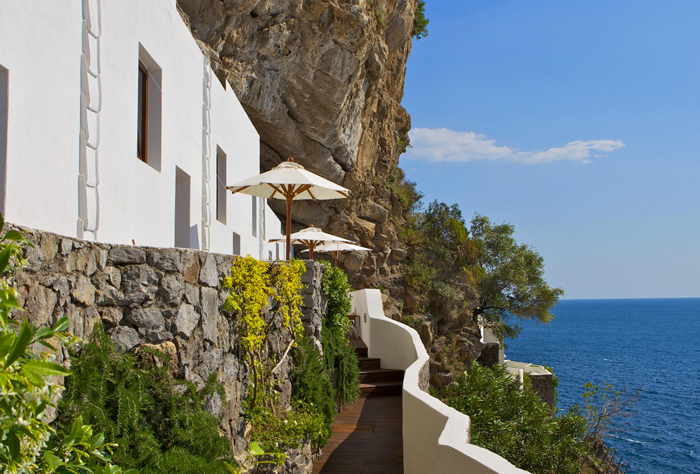 Nestled on a seaside cliff, this romantic 39 room, adult only boutique hotel is a hideaway where the staff pride themselves on pampering their guests, allowing them to escape the everyday. The white on white décor of the guest rooms and comfy beds dressed in pristine white Etro cotton sheets may entice you to spend your time inside but you would not want to chance missing all that the region has to offer. Easy excursions include strolling the narrow passageways and shopping in the quaint shops of nearby Positano, sailing over to the Island of Capri or soaking up the sun at La Gavitella Beach. Chef Leopoldo Elefante provides inspired, locally sourced cuisine in Casa Angelina’s fine dining restaurant, Un Piano Nel Cielo which translates “a floor in the sky.” The views are awe-inspiring and it is love at first bite to the last sweet as you experience the rich flavors of the Mediterranean region. The peak season for the Amalfi Coast is June through mid-September but I would highly recommend visiting in the fall and spring when the temperatures are still pleasantly warm but there are fewer visitors sharing the narrow, windy roads. Tailor-made for romance, Casa Angelina is a truly unique place for a proposal, destination wedding, honeymoon or romantic getaway. Stay tuned for Carolyn's full review of Casa Angelina in our Spring/Summer 2019 issue.